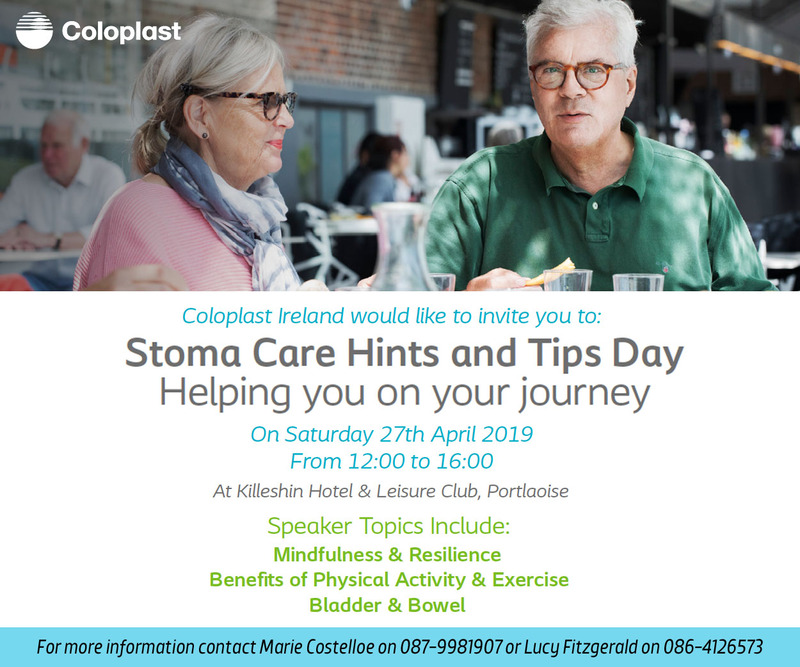 As the Laois ladies approach their final game of the national league this weekend against Clare, we thought we’d focus on another closing game for the Laois ladies. 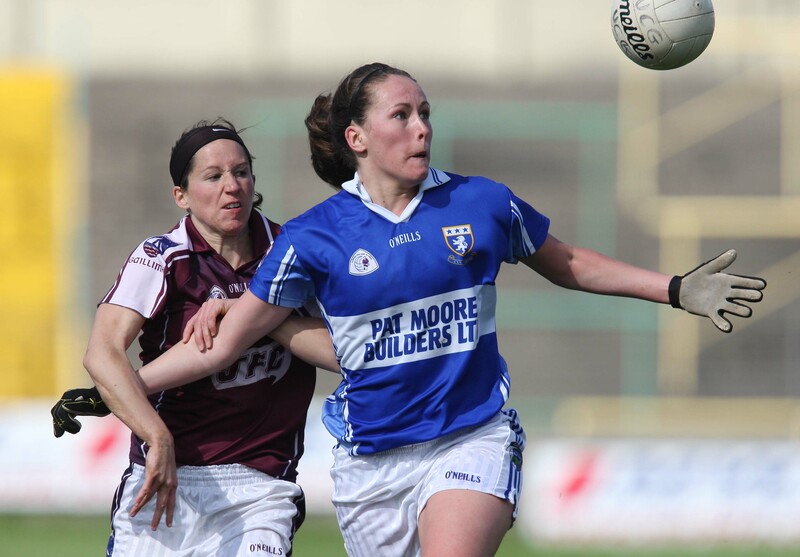 This was their 2011 meeting with Galway – where a final free kick from All-Star Tracey Lawlor shared the spoils and sent Laois into an All-Ireland league semi-final with table toppers Monaghan. 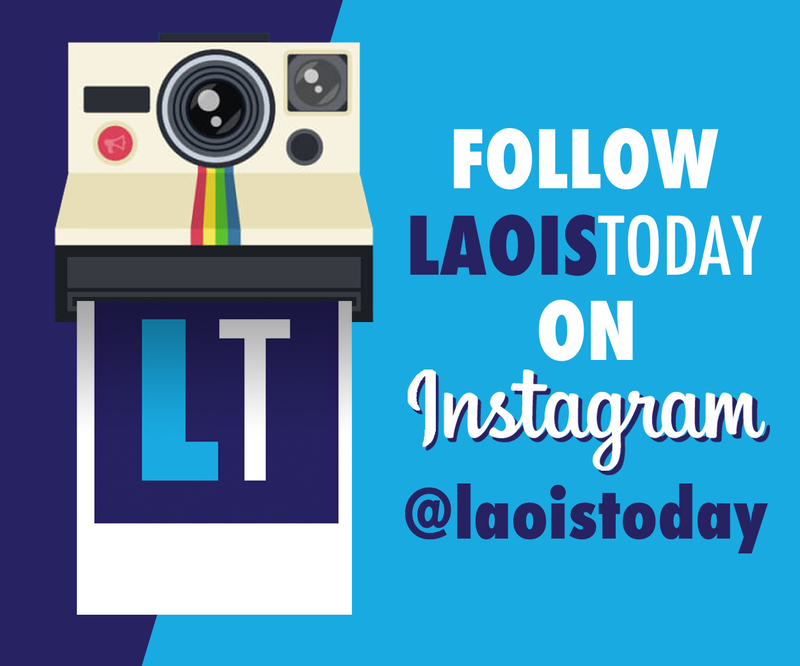 Laois defeated Monaghan in the semi-final showdown, 2-11 to 1-10. From here, Laois managed the magnificent feat of getting to the division 1 final against Cork. The Rebelettes cmae out on tops that day, but it was a huge boost from scraping into fourth position on the table to contesting the national final. A few of the current Laois ladies were involved on the field of play against Galway that Sunday. 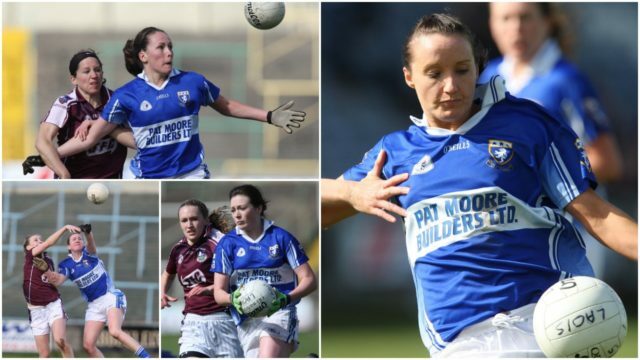 Ellen Healy, Jane Moore and Maureen Young all started for Laois, while Portlaoise native Aisling Kehoe was introduced after 47 minutes. It was a battle right from the off that day in O’Moore Park. Laois trailed for most of the encounter, but a thrilling finish meant they could walk away with a point beside their name on the leaderboard. 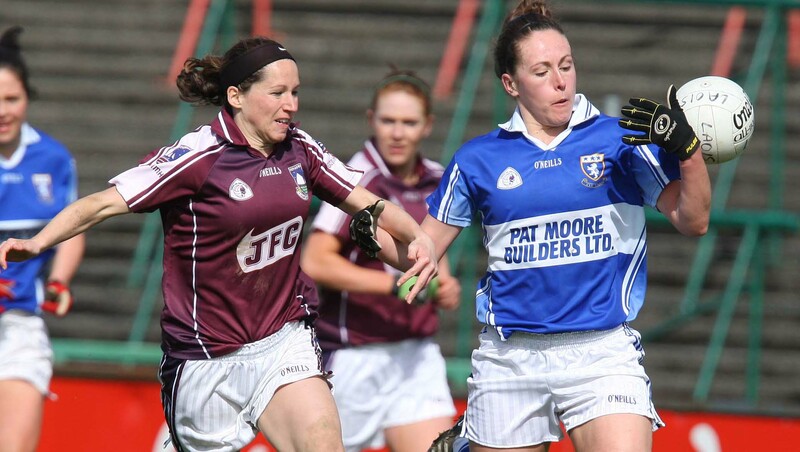 Galway’s Tracey Leonard caused mayhem for the Laois defence, opening the scoring for the Connacht side and helping herself to a brace of points afterwards. 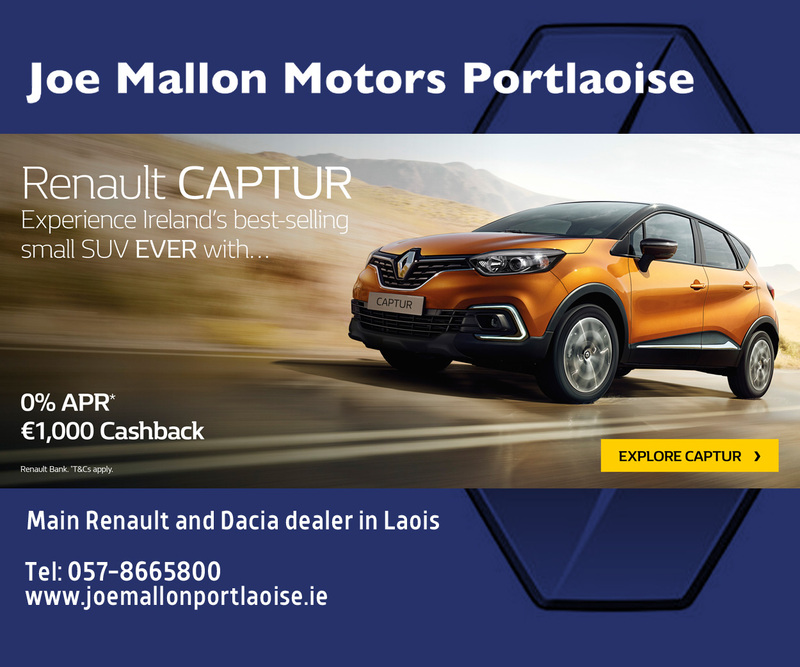 Tracey Lawlor opened Laois’s scoring account after eight minutes while Martha Kirwan found herself unlucky with two goal chances. One taking a deflection off Becky Walsh to skim over the crossbar, another trickling past the line. Laois trailed by two points at half-time. Laois picked up steam in the second half. 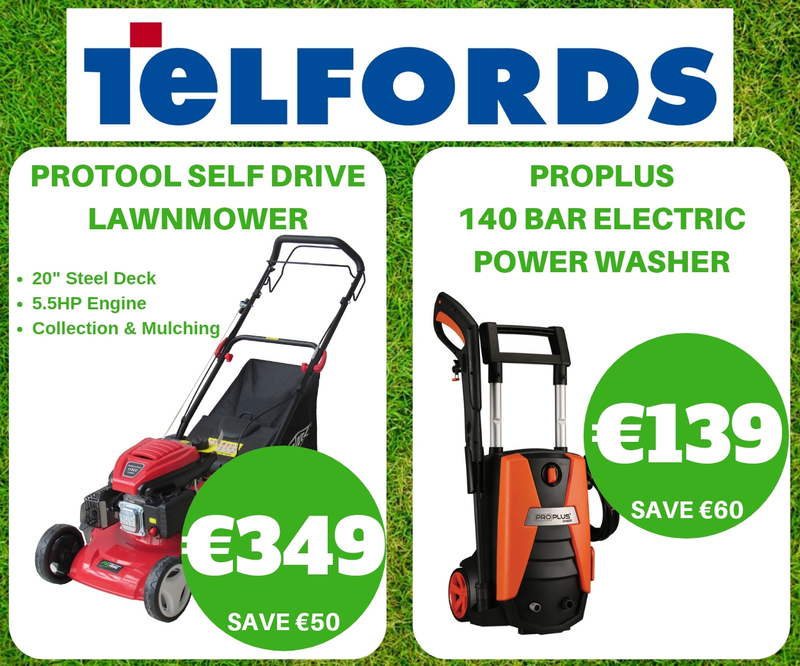 As Leonard earned an impressive tally of 0-5, Lawlor and substitute Kehoe did their work on the scoreboard for Laois. It was Aisling Quigley, now Donoher, who turned the game on its head. 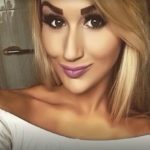 In a shocking turn of events after trailing for most of the game, the Timahoe woman kicked Laois ahead in the final minute of normal time. Although lining out at wing back that day, she proved just as comfortable on the opposing 13 metre line to send Laois into the lead for the first time in the game. However there was four minutes of additional time still to be played. Galway’s star performer Leonard hit back to clinch the game for the Westerners, or so they thought. Laois’s hopes rested on a game-deciding free kick at the feet of Lawlor. 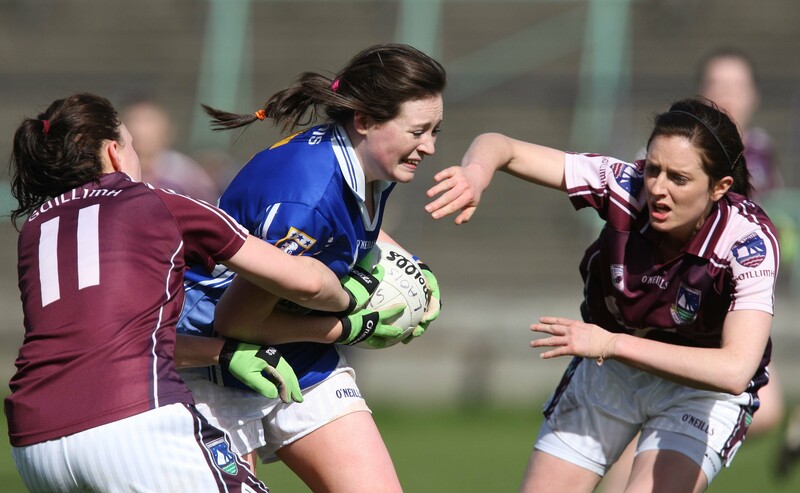 She converted with ease, and Laois managed to claw back from defeat to go through to the national league semi-finals. Laois finished fourth on the table, on equal points with Kildare and Tyrone, but went ahead on points difference. Tracey Lawlor scores for Laois while under pressure from Timahoe club player Rebecca McPhilbin, Galway in the Ladies NFL at O’Moore Park. Alison Taylor on the attack for Laois against Barbara Hannon and Emer Flaherty, Galway in the Ladies NFL at O’Moore Park. 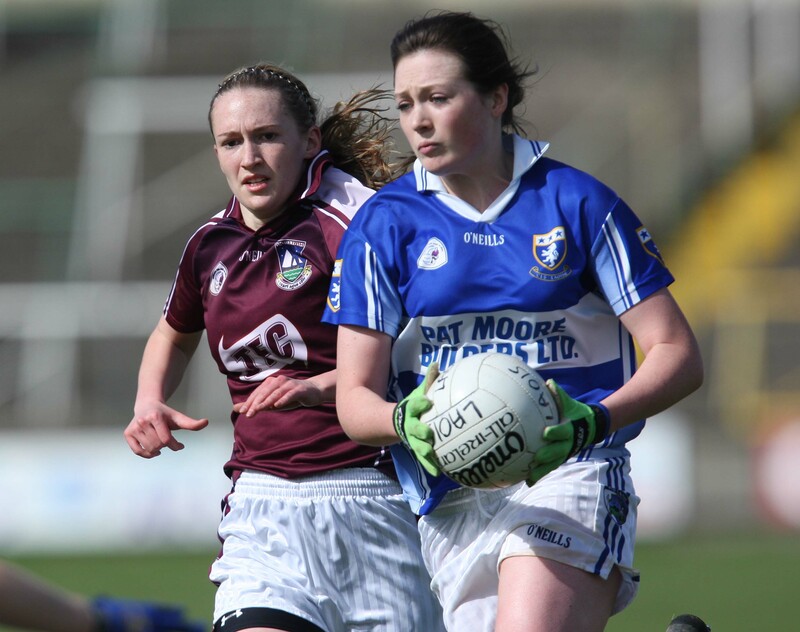 Martina Dunne in possession for Laois against Emer Flaherty, Galway in the Ladies NFL at O’Moore Park. 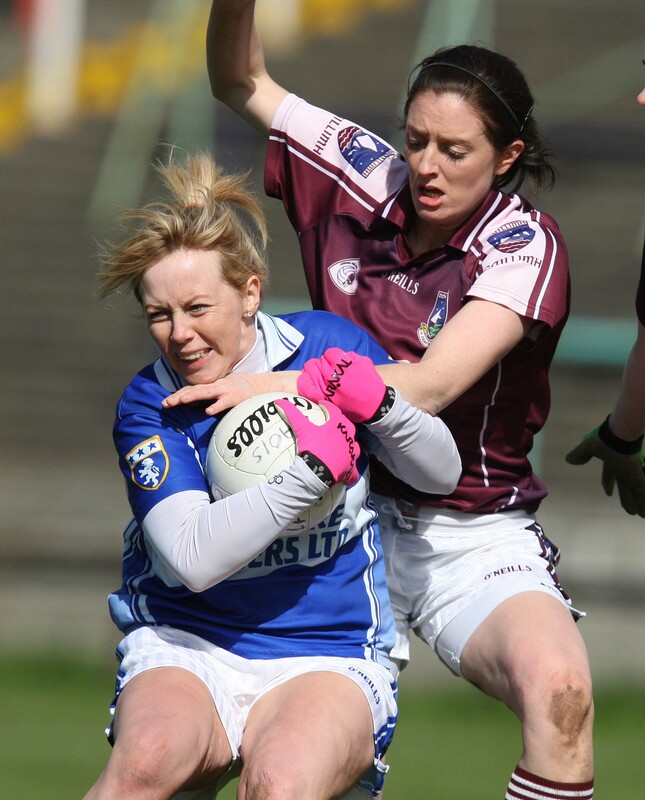 Laura Hyland wins this ball for Laois against Tracy Leonard, Galway in the Ladies NFL at O’Moore Park. Anna Moore gathers for Laois while under pressure from Timahoe club player Rebecca McPhilbin, Galway in the Ladies NFL at O’Moore Park. 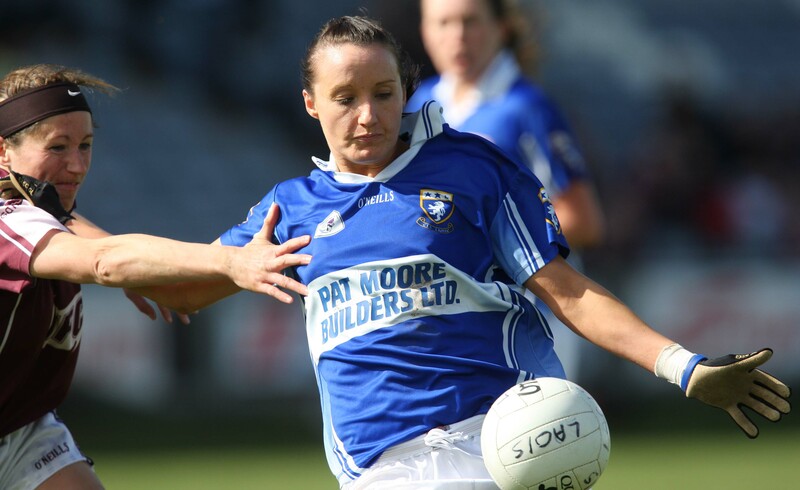 Anna Moore juggles this ball for Laois while under pressure from Timahoe club player Rebecca McPhilbin, Galway in the Ladies NFL at O’Moore Park. 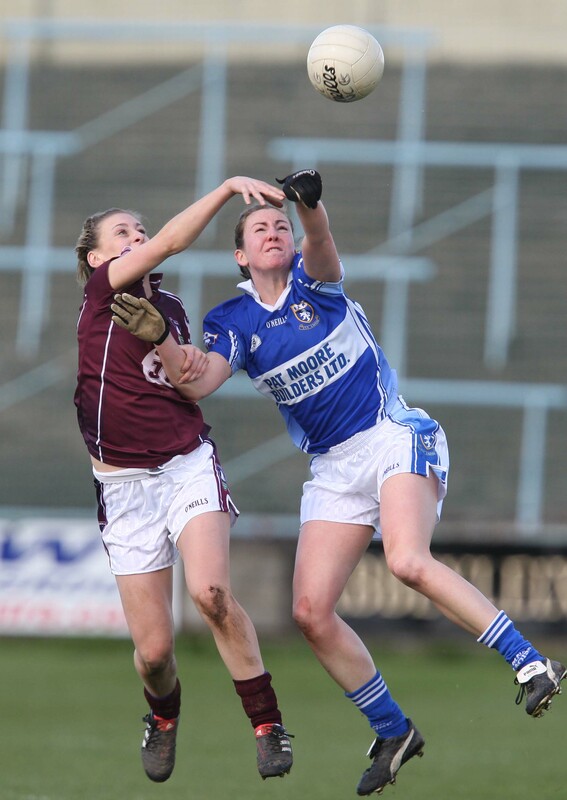 Alison Taylor on the attack for Laois against Aoibheann Daly, Galway in the Ladies NFL at O’Moore Park. 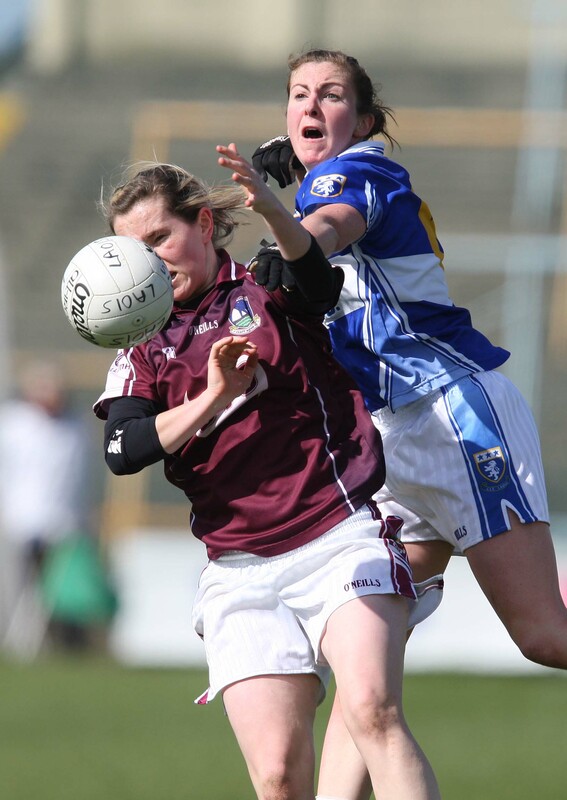 Laura Hyland wins this ball for Laois against Sinead Burke, Galway in the Ladies NFL at O’Moore Park.